If you want to learn how the US healthcare market actually works today, your best bet is to talk with medical clinic administrators. These folks sit at what I consider the front lines of healthcare. Everyday, they work to keep providers focused on their primary mission — delivering high-quality care — while balancing the diverse set of needs coming from patients. Layer on the fact that administrators must navigate a complex web of reimbursement schemes driven by commercial health plans and the government in order to maintain financial viability at their practices, and it becomes clear that they are well-positioned to become intimately familiar with each of the major components of the healthcare system: the patient, the provider, and the payer. Administrators face a dizzying array of questions as they adjust to a more patient-driven revenue cycle. Collect aggressively up-front for expected patient costs and refund patients later? Wait for the claims adjudication process to settle and risk a bulging patient A/R? Turn your front desk staff into cashiers but potentially alienate your patients? Hire an army of staff to manually churn-out predictions of patient financial responsibility in advance of high-cost procedures? As we asked administrators how they were solving these problems today, they would list off a number of point solutions, expressing exasperation at the sheer number and cost of technologies they were having to implement. As healthcare technologists, they eyed us with suspicion. “Another technology?” they would ask. It was evident that the market was in need of a more comprehensive, thoughtful approach to solving these problems, so we took a step back to carefully consider what was needed. As we debated and discussed the topic, our thinking began to coalesce around three basic components that a patient payment platform must embody in order to truly meet the needs of both medical practices and their patients. First, a truly valuable patient payment solution needs to cover the patient journey end-to-end. This relieves practices of the financial and operational burdens associated with juggling multiple solutions across the patient revenue cycle while offering patients the benefit of a single, consistent interface as they proceed along their path of care. This process begins as patients register for appointments (where they can be educated on their benefits and expected out-of-pocket costs), continues in-office with a simple way to complete co-pays (as they arrive) and to make down payments on services rendered that day and any upcoming procedures (as they leave), and ends with mobile-friendly options for completing outstanding balance payments and setting-up payment plans. Next, this solution needs to reflect sincere empathy and respect for the modern consumer-patient. Patients are no longer a financial afterthought for practices and, thus, should not have to interact with technologies that treat them this way. Therefore, this solution should leverage cutting edge consumer technology, clearly inform the patient of their benefits and financial responsibility, provide convenient and mobile-friendly methods of payment, and, in general, be designed to look-and-feel like other modern consumer technology products. Never again should a patient be forced to interact with a clunky web portal that transports them deep into ancient internet history. Finally, this solution needs to seamlessly integrate with the technology systems that practices rely on to run their clinics, namely their EHR and PM. This tight integration is required in order to minimize implementation costs, decrease confusion between patients and providers, and eliminate the need for any additional manual work to navigate between disconnected technology solutions. So What Platform Actually Does This? Looking across the spectrum of solutions on the market, I saw many products that embodied at least one of the core characteristics above. A few even did a pretty good job at two of the three. However, there wasn’t a single solution that incorporated all three. It was at that point, we aligned the vision for Clinic Q, the patient-facing solution we had begun to build at Health Here, with the three characteristics listed above. We knew that if we could nail each component, we would be providing clinics a comprehensive toolset that would allow them to address the needs of the modern consumer-patient and consolidate their technology stack. A little over a year ago, we completed our patient intake and registration platform, where we focused on user-friendliness and a deep, intelligent integration with a practice PM’s and EHR’s. Next, we incorporated a payment module for collecting co-pays and outstanding balances on our in-office kiosks, which we soon extended into mobile. And then, a few weeks ago, the Health Here team celebrated the completion of Q Code, a product that provides clinics accurate estimates of out-of-pocket patient costs as they schedule procedures, enabling providers to collect deposits and structure payment plans in advance of these events. 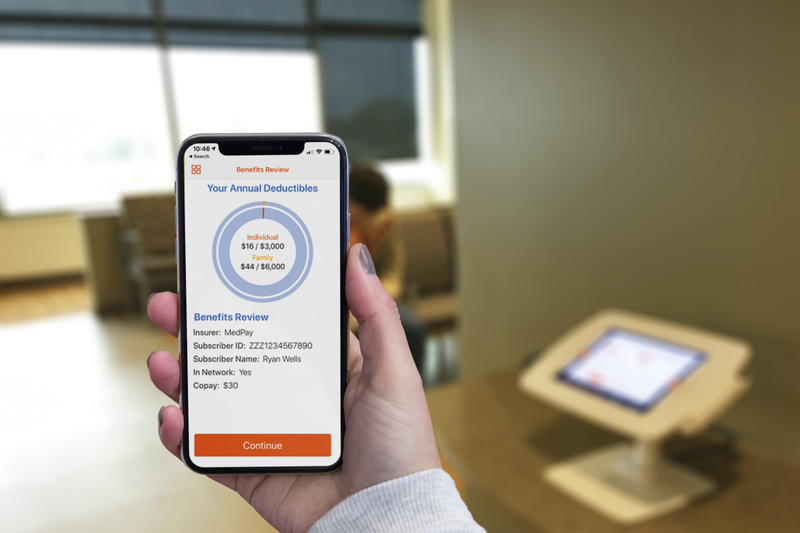 Q Codes patient-facing “check-out” interface also allows for clinics to collect patient payments for same-day services as they leave the clinic. Bundling this release into our existing product suite, we could now draw a line from the beginning of the patient revenue cycle (pre-appointment registration) to the end (mobile post-adjudicated payments) and map a Clinic Q product against each critical point in the process. The Q Code release, then, marked more than just the launch of a new product our team had worked incredibly hard to deliver. It also marked the moment when we achieved our goal of building this single, consumer-friendly platform that addresses the entirety of a clinic’s patient-facing needs. The work, of course, is not finished. To effectively refine and improve our product suite, we’ll need more input, feedback, and perspectives. As more clinic groups join the Health Here network, this process will accelerate. And as we grow, we’ll stick to the approach that got us where we are today: listen closely, build thoughtfully, listen some more, then iterate rapidly. By removing friction from patient onboarding and payments, Health Here enables healthcare providers to deliver more personalized care and empowers patients to take control of their health. Learn more on our website.